Soon, the warm sunny days of summer will be here. That will mean more time outside, playing in parks with friends, outdoor sports and maybe even wandering out into nature. If you're lucky, you might get to see a butterfly or two, either outdoors or at a botanical garden. Time to brush up on your butterfly knowledge. We’re not joking! 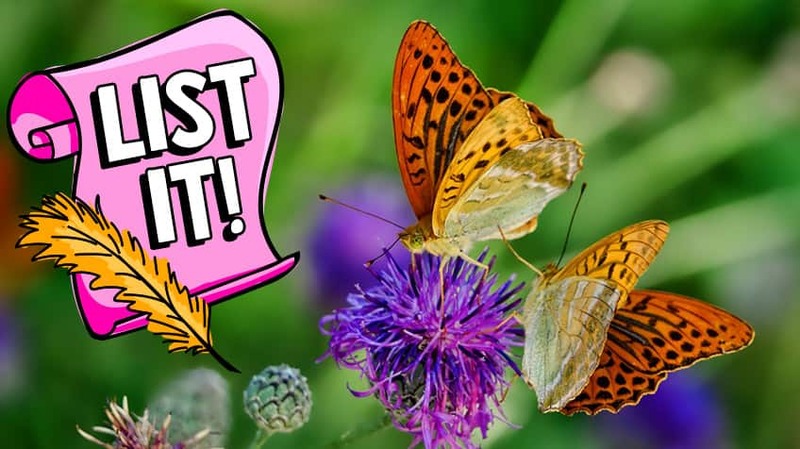 Long ago, Dutch scientists were studying butterflies. And they took a look at their poop — which is officially called frass. They noticed that the droppings looked an awful lot like butter. So they gave the insect the name butterfly. Some people suggest there’s another explanation for the name of these beautiful bugs. At one time, it was believed that witches turned themselves into butterflies and then flew off in search of food, especially butter. Female butterflies make a special sticky fluid that works like glue. They use it to attach their eggs to plants. The glue helps keep the eggs stuck in place. In fact, the eggs would be destroyed if anything tried to remove them from the plant. 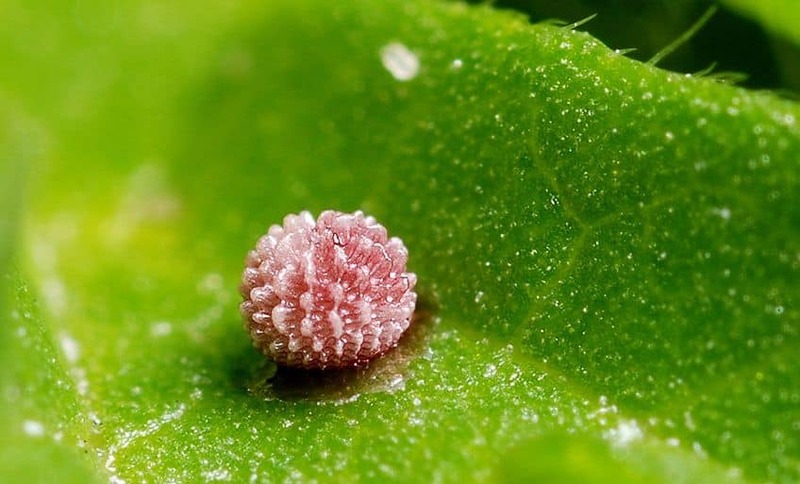 Once the eggs are attached to a leaf, a butterfly doesn’t stay to care for its young. But it does carefully plan where it lays its eggs. It only chooses plants that will provide caterpillars with plenty to eat when they eventually hatch from their eggs. 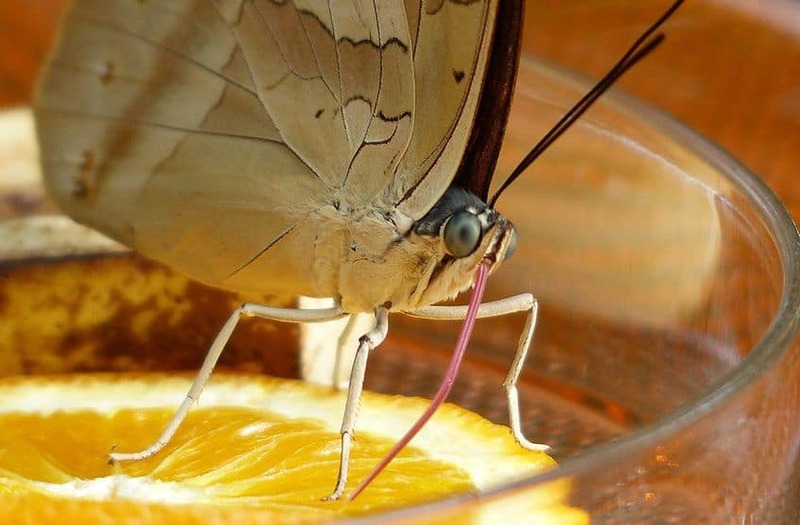 Mmm… It might sound strange to us humans, but butterflies rely on their feet to taste food. Their feet have taste sensors on them that help to locate food for their caterpillars. They stand on a leaf and give it a taste. If they determine the plant is something their caterpillars can eat, they’ll lay their eggs in this spot. As for how butterflies themselves eat? They can’t bite or chew. So butterflies use a long, tube-like tongue called a proboscis (say "pro-boss-kiss") to eat. It works like a straw, allowing butterflies to slurp up liquids like nectar, sap and juice from rotting fruit. Join the club! 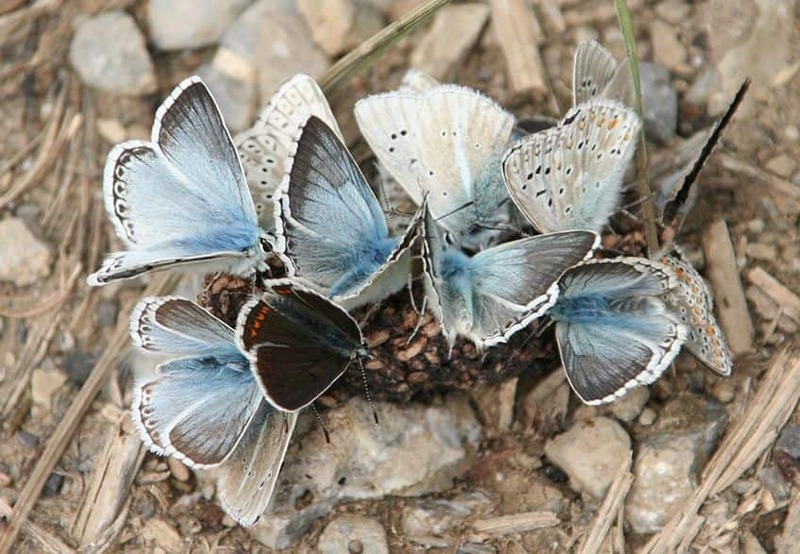 In some hot climates, it’s common to see groups of male butterflies fluttering around mud puddles. Called “puddle clubs,” these collections of butterflies gather near puddles or damp soil to slurp up the minerals found in them for dinner. Now that’s a lot of butterflies! And they’re all quite different. Some are small — like the western pygmy blue — which is about a centimetre in size. And others — like the Queen Alexandra butterfly — can reach about the same size as a dinner plate when its wings are outstretched! 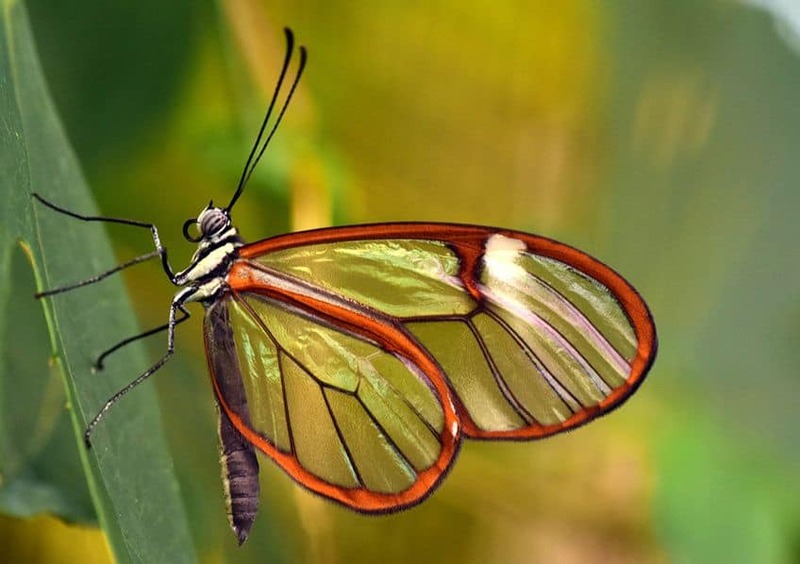 And while some butterflies come in all kinds of vibrant colours, others like the glass-winged butterfly have wings that are completely see-through. Plus, while most butterflies flutter along quite slowly, some like the skipper butterfly can fly quicker than a horse can run! What a family! The facility is set up like a tropical rainforest, allowing visitors to watch over 75 species of butterflies fly, eat and lay eggs. The exhibit, which is getting a big makeover, opens from late spring to early fall and lets guests see local species in flight. 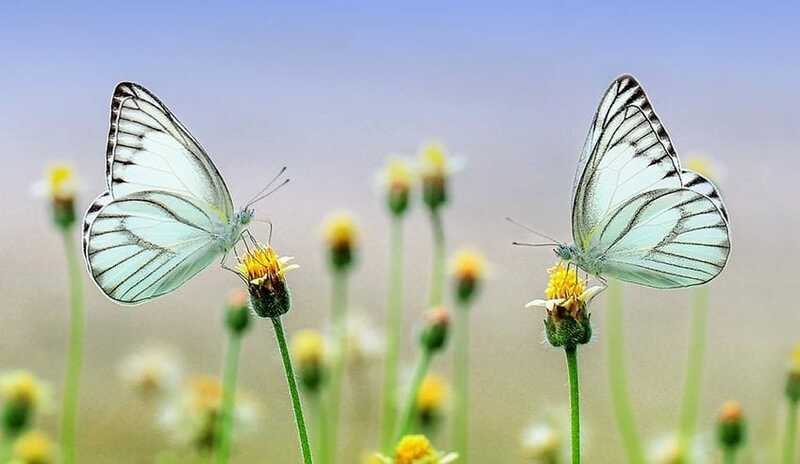 It is home to over 2,000 butterflies and 45 different species. Visitors can watch through a special window to see butterflies emerge from their cocoons and take their first flight. 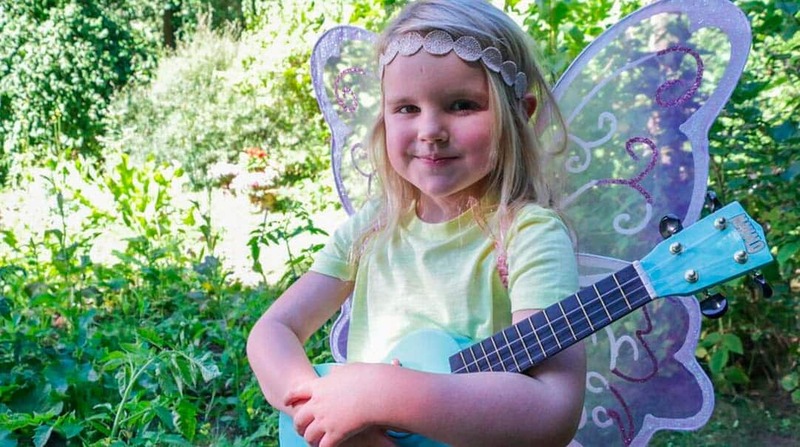 Every winter, an attraction called Butterflies Go Free is set up in the greenhouses of this botanical garden. That means over 2,000 butterflies and moths are released into the buildings. 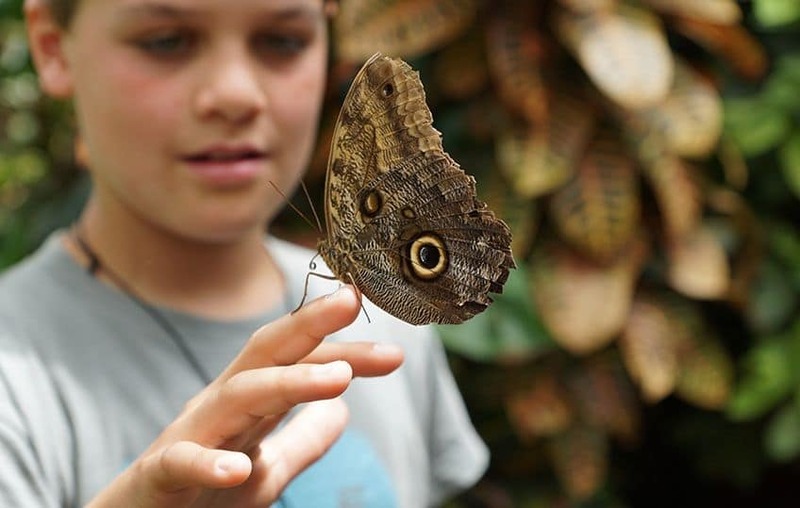 From June to September, visitors can stop in and get up-close to tropical butterflies from Costa Rica.